strong, but that was not going to stop any of the riders, who were ready for the finale. The weather had been fairly kind in the build up to the racing and this made for fantastic track conditions. The club welcomed over 230 riders, all ready to push hard in the last meeting of the season. Mitchell taking second and Ryan Allison third. Race two saw Nathan Dixon being able to pull away and take a strong win, Robert Yates was also able to take a comfortable second and George Turner third. Race three saw another successful ride for Nathan Dixon, taking a strong win. Robert Yates took second with Ryan Allison third. Overall results for the day Nathan Dixon, Robert Yates and Ryan Allison. Next out were the Vets. Matt French took the lead in race one and pulled away from his rivals managing a convincing win. Paul Willis rode an untroubled race to take second and Brett Barker rounding up the top three places. Race two saw a tight race between Matt French and Paul Willis with Matt taking the win and Paul taking second and Arvydas Bartasius taking third. Race three saw a sensational ride by Matt French, taking a confident win with Paul Willis second and Arvydas Bartasius third. Overall results for the day Matt French, Paul Willis and Arvydas Bartasius. The Open class saw race one have several battles taking place throughout the field. Callum Mitchell and Jordan Moxey battling it out with Connor Dennis and Jimmy Wayman also fighting hard with one another. Callum Mitchell worked hard to take the win with Jordan Moxey second and Connor Dennie third. In race two Jordan Moxey demonstrated dominance over his competitors, taking an exceptional win. Tommy-Lee Morris taking second and Piers Skinner third. Race three saw another outstanding ride by Jordan Moxey taking the win with Daniel Patterson taking second and Tommy-Lee Morris third. Overall results for the day Jordan Moxey, Tommy-Lee Morris and Daniel Patterson. The Auto riders were ready for a sparring match in each of the three races and gave some spectacular racing to watch. In race one Hayden Statt and Ben Casey pulled away from the field and fought hard for the top spot. Ben Casey took the victory with Hayden Statt second and Archie Britton third. Race two saw Statt working incredibly hard to take the win with Ben Casey second and Archie Britton third. Race three saw yet another tough battle taking place or the top two spots. Ben Casey was able to take the win with Hayden Statt second and Archie Britton third. Overall results for the day Ben Casey, Hayden Statt and Archie Britton. Junior class was wide open with some intense and exhilarating racing taking place. In race one Kayden Smith took the lead and pulled away from the remainder of the field. He rode a strong race to take the win, with Harvey Antrobus working amazingly hard through the pack to take second and Kai Thorpe a well earnt third place. Race two saw Harvey Antrobus have a much better start which gave him the lead from start to finish. Kayden Smith rode a strong race to take second with Kyron Carron taking third. Race three saw another dictatorial performance by Harvey Antrobus, again leading from the start to take the win with Josh Vail taking a well-deserved second and Kayden Smith third. Overall results for the day Harvey Antrobus, Kayden Smith and Harvey Packman. The Small Wheel races saw a breath taking race one with several riders battling it out for the top spots. Liam Bennett took the lead and worked hard to maintain the position. Slowly Liam was caught and Wal Beaney was able to take the top spot with Boston Gilbert second and Liam Bennett finishing off the top three. Race two saw Arai Elcock take an impressive lead and turned it into the race win with Wal Beaney taking second and Callum Murfitt working hard to maintain third. Race three saw Wal Beaney back out front to take the win with Arai Elcock second and Boston Gilbert taking an exhilarating third. Overall results for the day Wal Beaney, Arai Elcock and Boston Gilbert. The Big Wheel class saw Thomas Harris take a commanding lead in race one leaving the racing taking place behind him. Tom Sedgwick was able to take second after an outstanding ride and Travis Steels taking third. In race two Thomas Harris and Travis Steels were battling hard with Travis taking the victory, Thomas second and Buster Hart taking third. Race three saw Thomas Harris fighting hard to take the lead and pull away from the pack. Thomas took a comfortable win with Buster Hart second and Tom Sedgwick third. Overall results for the day Thomas Harris, Travis Steels and Tom Sedgwick. The Senior class saw, as always, some dramatic battling with some magnificent racing taking place throughout the field. Race one saw Drew Anderson work his way through to take the lead and be able to pull a gap from other competitors. Drew took the win with Todd Leadbitter second and Toby Avis third. 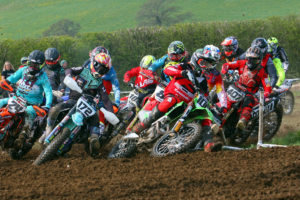 Race two saw a tussle between the top four riders, with the race being open for the taking. Toby Avis was able to see off challenges to take the win with Ryan Allison second and Todd Leadbitter third. Race three saw another strong performance by Drew Anderson to take the win with Toby Avis second and Todd Leadbitter rounding up the top three. Overall results for the day Toby Avis, Drew Anderson and Todd Leadbitter. EASSC would like to thank their sponsor Jacksons Coaches.